The mammological collection of the Institute of Zoology includes 6685 mammalian specimens of 111 species of 23 families and 6 orders. Of obvious interest are serial collections of mainly the background species inhabiting various landscape zones of Uzbekistan. One of the benefits of the collection is that almost 4692 specimens (almost 70%) have measurements. The collection fund has 89.9% of the entire diversity of the mammalian fauna of Uzbekistan: all five insectivorous species, 78.9% of chiropterans, 76% of predators, 7 out of 10 species of ungulates, 85.7% of rodents and both Lagomorpha species. 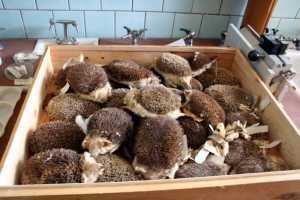 Individual specimens and series of 24 mammalian species outside the fauna of Uzbekistan (East Europe, Siberia, the Far East) are also available in the collection. Serial collections of bats made by O.P Bogdanov in 1940-1950 (277 specimens or 4.1% of the current materials of the collection) formed the basis of the mammalian collection at this institute. The laboratory of mammology under the leadership of the merited scholar G.S. Sultanov, in which O.P. Bogdanov, T.Z. Zakhidov, V.P. Kostin, H.S. Salikhbaev, was founded in 1966. Before the establishment of this laboratory, the laboratory of terrestrial invertebrates had studied mammalians. In mid-1950s the fauna of the rodents inhabiting the lower course of the River Amudarya was explored by V.P. Kostin. The fauna of the vertebrate animals inhabiting the Golodnaya steppe was studied by T.A. Pavlenko in 1957-1959. In 1960-1962, the mammalian fauna was studied by integrated expeditions in which the following scientists worked: O.P. 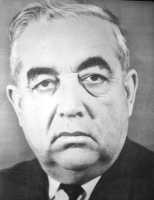 Bogdanov, G.I. Ishunin, A. Zakirov, M.M. Mukhamedkulov, and T.A. Pavlenko. 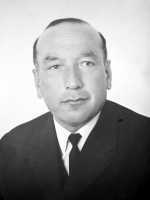 The following scientists explored the Karshinskaya steppe in 1963-1965: A. Zakirov, D.Yu. Kashkarov, M.M. Mukhamedkulov, A.A. Petrova, N.E. Pirnazarov and H.S. 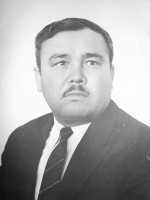 Salikhbaev. In 1967-1968, the studies in the areas of Ridge Nuratau were carried out by O.P. Bogdanov, S.T. Gubaidulina, A.Zakirov and H.S. Salikhbaev. In 1968-1972, K.Allabergenov, A. Zakirov and T.A. Pavlenko explored the mammalian fauna in the Ferghana Valley. In 1966-1970 and 1981, N.N. Volozheninov studied the ecology of mammalians in the nature reserve Aral-Paigambar. The collections made during this study were the major contribution to the collection fund. From 1961 to 1980, the study of predatory mammalians inhabiting the middle course of the River Syrdarya was conducted by V.I. Taryannikov, who was heading the laboratory in 1986 to 1998. In late 1970s, E.A. Chernogaev studied the biology of the mole vole. In 1981-1998, the collections of rodents and predators from various regions of Uzbekistan were made by Esipov A. In 1991-1995, E.A. Bykova studied the rodents, focusing her studies on the Muridae species. All these studies resulted in the replenishment of the collection with 918 specimens (13.72% of the entire collection) in the period from 1981 to 1999. In the territorial respect, the most part of the mammological collection has been made in nine districts of Uzbekistan. The most numerous collections were made in the Pamirs-Alai region (24.15% of all specimens) including 62 species of 6 orders. These are followed by collections made in the desert Kyzylkum (14.65%) and the Amudarya region (11.61%). The collection from western Tien Shan is less numerous (9,89%), the middle and lower course of the River Syrdarya (6.33%), the middle and lower course of the River Kashkadarya and adjoining areas (6.21%) and flat-land areas of Tashkent province (5.17%). Animals with the indefinite geographic confinement constitute 3.63%. One of the main keepers of the collection during his entire working activity at the laboratory from 1966 to 1997 was N.N. Volozheninov, who contributed much to the keeping the collection log, developed a system of codes for geographic districts and made an attempt to compile a card-index. The mammological collection is situated in the building of the Institute of Zoology of Uzbek Academy of Sciences, in room 76 on the third storey. The skins and skulls are kept in special cabinets, in drawers with covers. The fumigation of the collection is carried out every 2 or 3 years. There are complete collection logs and an electronic database.